Rush as part of the Peyton Place cast, 1969. 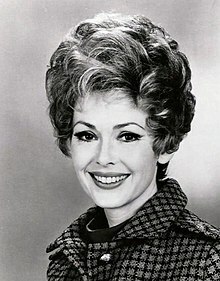 Barbara Rush (born January 4, 1927) is an American stage, movie, and television actress. She is known for her roles in It Came from Outer Space!, Bigger Than Life, When Worlds Collide, The Young Philadelphians, and Robin and the Seven Hoods. She also appeared on television shows such as Peyton Place, Batman, All My Children, 7th Heaven and Knight Rider. She won a Golden Globe Award in 1954. This page was last changed on 1 January 2016, at 23:18.